this book finally opened me up to imperialism: the word "UNDERDEVELOPED". History speaks about "the colonization of Africa", "imperialism", and "imperialism and colonialism" as though they were perpetrator-less crimes. Decades later, this affects how we see and refer to the world: "developing countries" vs "nondeveloped countries" vs "developed countries" vs "overdeveloped countries/industrialized nations". These terms use the passive voice grammatically. There is no active voice. How did this nation BECOME underdeveloped? It is NOT that they have not "caught up to the natural flow of things". Rodney is a classic to be immortalized because he said, No; these countries are not "poor" out of nowhere; nor are they are undeveloped. 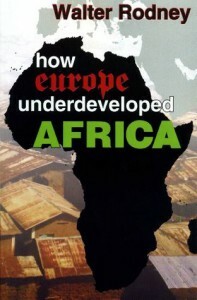 Europe UNDERDEVELOPED Africa. Underdeveloped. Verb. To actively rob, steal, hinder, and deliberately reverse the progress or development of a nation. This is why I now refer to countries with a low GDP as "underdeveloped". It puts the historical action in the hands of the oppressors. Africa didn't just wake up one day, after the days of Great Zimbabwe, Songhai, Mali, Ghana, Nubia, and Egypt, and decide to "mismanage itself". Europe colonized it and Europe caused Africa's current state. Rodney uses empirics to show that, OF COURSE, had it not been for Europe invading and colonizing Africa, the societies of the continent would have continued their progress and development. Underdeveloped: it gives agency and culpability to Europe. That one word changed my life.